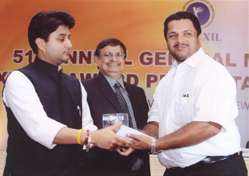 Right from the inception Hillwood group of companies has taken utmost care to follow good business ethics in the business we involve. The Company managed not only to strengthen the stabilization tendency, which evolved in the last several years, but also to have substantial achievements in all spheres of business we does. 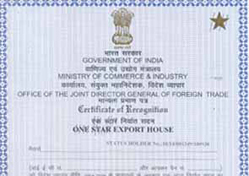 The Bureau Of Indian Standard (BIS) is another Achievement which shows the Standard of the products. 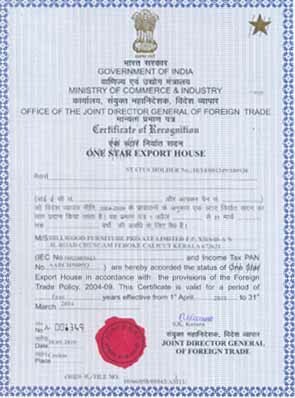 We have got recoganization as "EXPORT HOUSE" by Govt. 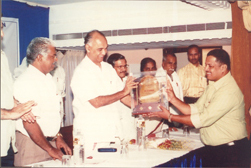 of India, Departmnet of DGFT, Cochin. 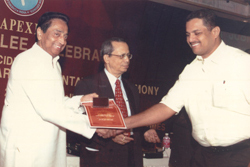 V. Shareef Managing Director receiving the certificate of Merit Award from Mr. Kamalnath hon’ble Union Minister of Industries and Commerce, Government of Inida for the year 2006-07. 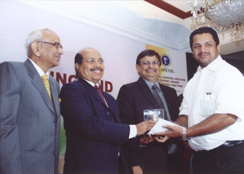 V. Shareef Managing Director receiving the Award from Mr. Elamaram Kareem, Hon’ble Minister of Industries and Commerce, State of Kerala, for the best exporter in Timber instituted by KSSIA, Calicut.